The Middle-Atlantic 5CC4326 Cable Chase Kit for 5-43-26 is bolted between racks, providing additional room for wiring and power distribution in multi-bay applications. The 5CC4326 includes front, rear, and top channels, as well as mounting hardware. This kit is required when installing doors on multi-bay Slim 5 racks. 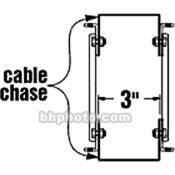 Fits the Middle Atlantic 5-43-26 equipment rack. Provides additional room for wiring and power distribution in multi-bay applications. Includes front, rear, and top channels. Dimensions (WxD) 3 x 26"
Box Dimensions (LxWxH) 85.0 x 5.0 x 5.0"